Local housing association, North Star Housing Group, is building 25 new homes near Bishop Auckland. 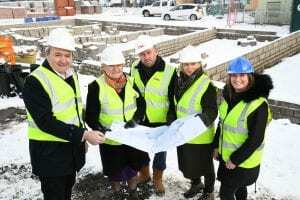 To mark the start of this exciting regeneration project North Star and Gus Robinson Developments were joined on site by Helen Goodman, MP for Bishop Auckland and Cllr Kevin Shaw, Portfolio Holder for Strategic Housing and Assets at Durham County Council. The site, in West Auckland, brings life back into an area that had been derelict for almost a decade. Planning permission was achieved in March 2018 and after a period of site preparation, demolition was completed on a disused care home, which had stood empty since 2010, to make way for new affordable housing. Emma Speight, Executive Director of Assets and Growth for North Star, said: “We are delighted that construction work is underway at The Green, West Auckland, in our latest scheme to deliver affordable housing in the Teesdale area. The neglected site had been a huge concern for locals over recent years, and we are pleased to be able to regenerate the area and provide affordable housing, including much needed bungalows, for the local community. North Star is a group of housing associations, including Teesdale Housing Association, operating across the North East and North Yorkshire, building and renting high quality affordable housing to meet a variety of needs, including specialist supported housing. The group is committed to creating homes and building futures as well as investing in people at every level. The £3.3m project will receive nearly £1m of grant support from Homes England to enable the properties to be let at Affordable Rents. North Star teamed up with contractor Gus Robinson Developments to develop the new homes, which comprise of a mix of two and three bedroom family homes and two bedroom bungalows. Gus Robinson is a national Building Contractor who provide a range of construction and building services.